There is no official start date of the Kelowna Medical Society. 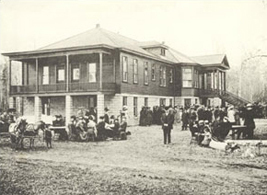 Kelowna physicians began meeting together in 1904, when Dr. Knox arrived in town on the S.S.Aberdeen paddle wheeler, bringing the total number of doctors in the ‘city’ to two (with about 275 potential patients). The original purpose of local medical societies was to gather together to share case histories, seek input from peers, and contain local outbreaks. Now the Kelowna medical community comprises at least 250 doctors of various disciplines. The Kelowna Medical Society seeks to become the central gathering place of Kelowna physicians for both social and professional development events. We are hoping to reunite the community and honour local accomplishments in the profession. Please consider joining us; we would especially like to welcome physicians from our local walk-in clinics. Please take a look through our website. Refer to the constitution and bylaws pages for more information about the society. We welcome your photos, stories and announcements and hope you will become a regular visitor.